Growth hacking. Now there’s an overused buzzword of late. But do you really want to “hack” growth? Or do you want to take a smart, sober evaluation of the opportunity and create and execute on a strategic plan? This case study with Acorio shares a strategic path to growth. Read on for a behind-the-scenes look at the fifth-fastest growing company in Massachusetts, the largest 100% dedicated ServiceNow consultancy. 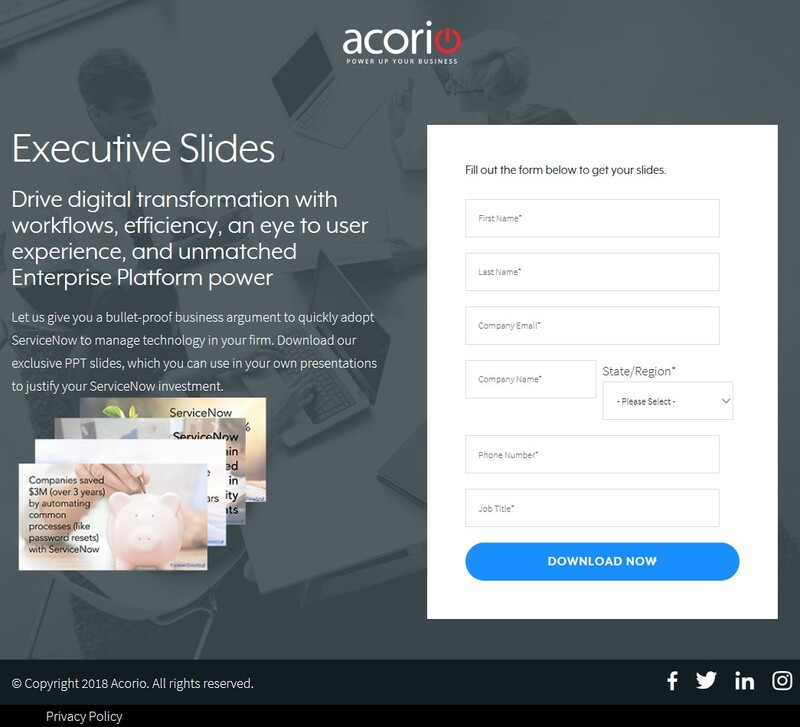 Acorio is a consulting services firm focused exclusively on helping companies adopt Service Management across their enterprise using the ServiceNow platform technology. It is a Gold-level ServiceNow services partner, one of only 20 Gold-level partners in the company ecosystem of more than 600 partners. Essentially, it helps companies change the way they do work — by improving both internal and external employee and customer experiences, and breaking down technology silos. The company focuses on midsize and larger firms up to enterprise companies, and works with departments as diverse as Customer Service, Human Resources, IT Operations and Service Desks, as well as the Security Operation and Finance function. Client roles range from manager to chief transformation officers and CEOs. “ServiceNow is the fastest-growing cloud platform. Ever. And it’s been pretty amazing to be along that ride — and growing really fast with them. We've had 116% bookings increase year-over-year,” said Meghan Lockwood, Director of Strategic Marketing, Acorio, who surpassed the company’s goal of 70%. The startup was named by the Boston Business Journal as the fifth-fastest growing company in Massachusetts and has had 1,040% growth since 2013. The 130-person startup has a three-person marketing team, to support eighteen inside and outside sales reps/account executives, plus its BDR (business development representatives) team. Lockwood also sought to move Acorio up further within the organization from only getting IT manager leads to also finding a way to pull more executive titles into the funnel — for example, a chief transformation officer as a lead to help with growth in deal size. The team analyzed six months of data across four channels: Events, emails, partnerships and social media. They looked at what was working among current efforts but also tried to find new opportunities as well. The website was one underused asset. It was three-years-old at the time, had recently been redesigned but was not generating any leads. “It wasn’t well optimized for conversion,” Lockwood said. The website did not have a self-evident value proposition, and while there were calls to action on it, they weren’t visually distinct, or they were at the very bottom of the page. Before, the top fold of the website homepage included a hero image with a quote from a customer and the average customer satisfaction rate. While that emphasized a core competitive advantage, it didn’t pass the “blink test” by grounding the new visitor in what the company did or what the next step in the process was. Lockwood decided to test what would happen if they pivoted the top funnel copy to talk to the reader and offered an immediate conversion path disguised as a way for the reader to learn more. Let’s optimize your ServiceNow journey. 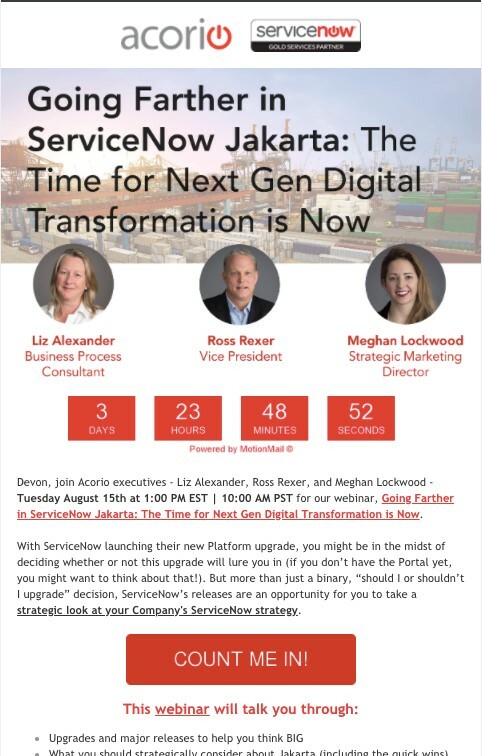 Acorio is an expert ServiceNow consulting firm who will inspire and guide your Service Management journey and maximize your investment in ServiceNow. “We paid $108 for a new WordPress theme [to facilitate these changes]. It wasn’t a perfect value proposition yet, but it was a start — and a good one. That initial change drove an extra $4.3 million pipeline from the website in the first year,” Lockwood said. People who Acorio had never connected with before represented $2 million of that pipeline. That success helped Lockwood get the budget she needed to make further investments. Once the funnel was optimized for conversion, the team focused on getting more traffic to the website, adopting an inbound marketing approach to pull people into the funnel. “Cadence is critical for inbound,” said Lockwood. The team increased its webinar schedule from “intermittent” to once per month and focused on thought leadership content with senior executive guests. In addition, the blog also did not have a specific cadence or content calendar previously. Lockwood set a goal of publishing one blog post per week. The team tried to rally the entire company around these goals in a fun way. They gave points in the company’s employee recognition rewards system to people who come up with strong content ideas. Some of the posts were written by Acorio staff from throughout the organization, and some were written by the marketing team. The team identified two key audiences: Decision makers (e.g., CIO, director of technology, head of HR, head of customer experience, etc.) and decision influencers (e.g., developers, managers, etc.). All the thought leadership content didn’t have a serious tone, though. The team tries to have fun and get people excited — like with a “Game of Thrones” themed blog post. “We did alter egos that matched nine key features of ServiceNow with a character in ‘Game of Thrones,’ and that was a fun hit,” said Devon Clarke, Senior Marketing Associate, Acorio. “Even if they're sitting at a desk and not at their kid's soccer game, you're still marketing to a person,” Lockwood added. And the blog posts delivered. For example, one blog post with a SlideShare drove four new opportunities worth $457,100. For its webinars, Lockwood used the Acorio executive team as presenters. 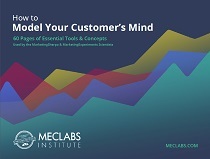 “Something I learned from working at MECLABS Institute is, ‘What is the value proposition for this session? Why would someone invest 30 minutes with us?’” Lockwood said. By putting only senior people on the webinars, they differentiated from competitors who tended to have sales teams selling products. For example, in a recent webinar, Acorio had the CEO and Head of Solutions and Innovation discussing helpful strategic content — selling a business plan to a board. Lockwood hosts the webinars, her team prepares the content, and they give the executives something that is easy to react to. Lockwood’s team also custom designs each presentation, which usually ranges around 30 slides. Initially, there were no call-to-action buttons on the blog. So, at first, Lockwood just added buttons. “Sometimes marketers wait too long until something is perfect. I admit, they were ugly buttons at first. But at least we were able to add a CTA to the blog,” Lockwood said. As a next step, when Clarke came on board, she began creating custom designs for each conversion point (e.g., a white paper download). 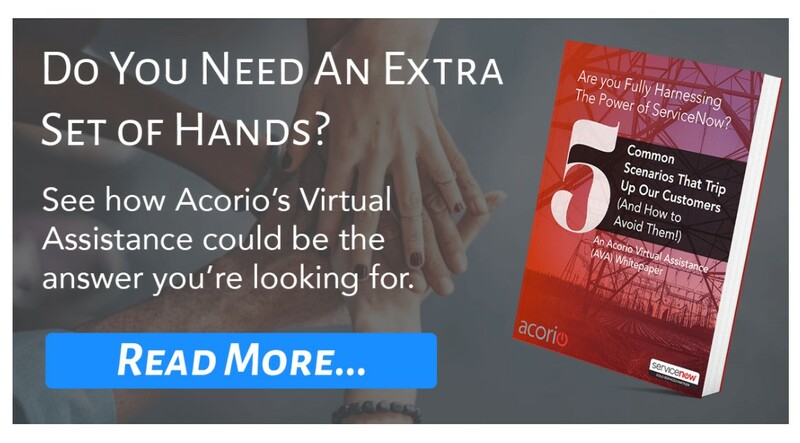 For Creative Sample #6, for example, the copy was tested to discover that the “Do you need an extra set of hands?” approach was the messaging that resonated best with Acorio’s ideal customer. However, the team knew that having compelling copy wasn’t enough. “You can have a really juicy value proposition, but you need to marry it with smart, compelling design. People are looking at it on their phones and have short attention spans, so it also has to be visually interesting and distinct,” Lockwood said. 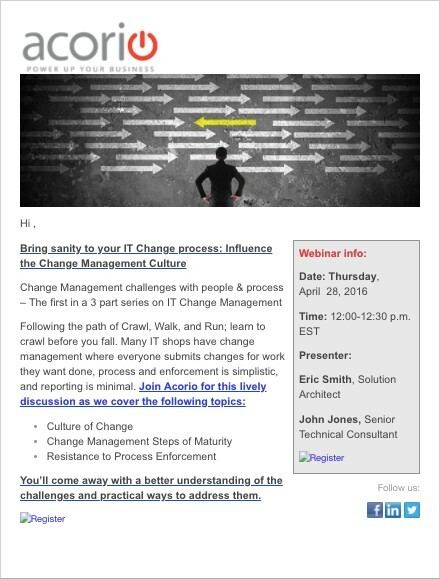 Another content element the team optimized for conversion is webinar invites. More on that in the next step. “I believe in optimization. That’s my marketing philosophy. Every email, every social media post, every website title, we have an A and a B version and test everything we do. From all of these small discoveries, every day, every week, we make great strides over time,” Lockwood said. “Ask yourself, ‘What don’t I know, what haven’t I thought of?’” she advised. From testing email invites for webinars, they discovered a surprise hit — the countdown timer. Created from a free online model, the team used the countdown timer to leverage the power of scarcity. The countdown timer grew email clickthrough 74% to a 17% average clickthrough rate, and as you’ll see in the results, this single email edit helped drive $6.6 million in B2B opportunities. Through this series of testing and optimization over time, the team made a series of other changes to the webinar email invites as well. For example, adding pictures of the presenters. Webinars are an inherently human-to-human communication, and adding pictures of the presenters can help humanize a virtual event. In addition, by better segmenting their list, the team increased open rate by 84%, and clickthrough rate increased 265%. After a few more rounds of website optimization, and with increased traffic, the website now generates $5.5 million worth of pipeline per year. Before the email testing began, the webinars attracted about 50 registrants, each with a high of 127, from sending four emails for each webinar. After making some of the changes from the email testing, the average increased to about 150 registrants, with three webinars generating more than 200 registrants. And the team hit a high of 370 registrants and 151 live viewers from sending just one email. “So that's not bad. About $300,000 in pipeline for one half-hour webinar is not terrible,” Lockwood said. But more than that was the significant growth in high-quality leads. For example, an earlier webinar had 75 leads, five opportunities and $345,000 in pipeline. The very next month, the team promoted an IT operations management webinar, and the only difference was using the countdown timer. The webinar generated 213 leads, 14 opportunities and $1.8 million in pipeline – of which $980,000 was net new. In that month, $100,000 of that pipeline closed. “If you can do a ticking clock and get more people there, do the ticking clock,” Lockwood said. In total, webinars have accounted for 1,282 leads and more than $6 million in opportunity pipeline in the past 12 months. The pipeline resulted in 20 new customers for $1.16 million in closed business.